(Newser) – Frequently drinking too much booze does not mean you're an alcoholic. In fact, it means that only rarely. A new study by the CDC and the Substance Abuse and Mental Health Services Administration finds that 1 in 3 American adults meet the definition of heavy drinking—for men, having five or more drinks in one sitting or 15 or more in a week; for women, having four or more drinks in one sitting or eight or more in a week. 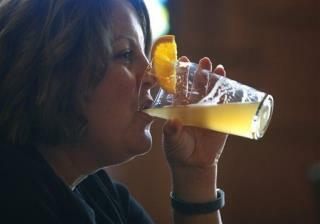 But of those so-called "excessive" drinkers, only 1 in 10 also meets the definition of alcoholism or alcohol dependency, which the CDC says involves "a current or past history of excessive drinking, a strong craving for alcohol, continued use despite repeated problems with drinking, and an inability to control alcohol consumption." I was sitting in a bar with HMunster last week. He looked across the bar at 2 old drunk guys and said, "You see that? That's us in 10 years." I said, "That's a mirror you dipshit!" Heavy drinking could probably be considered a risk factor for developing an alcohol dependent metabolism. "Roughly 88,000 deaths in the US every year are blamed on excessive drinking..." In 2010; 31,076 deaths in the US were blamed on firearms for homicides, suicides and unintentional shootings. 11,078 firearm deaths were homicides. 19,392 firearm deaths were suicides. 606 firearm deaths were unintentional shootings. Excessive drinking is nearly 3 times more dangerous than firearms. The most accurate analysis using "unintentional" death (apples to apples) statistics reveal that alcohol is by far the most dangerous and lethal. This reveals that excessive drinking is 145 times more dangerous than firearms. Of course if the criminals and depressed individuals could use alcohol to intentionally kill others and themselves; then we would see significantly more deaths by alcohol.